Spanish Ebola nurse contacted officials three times before quarantine. Health workers protest about the government’s handling of the Ebola infection. Ebola’s recent arrival in the U.S. and Spain has exposed pretty serious gaps in Western governments’ response to the virus. In the U.S., Thomas Eric Duncan, who died from the virus on Wednesday, was sent home from a local hospital days before testing positive for Ebola, despite disclosing during the initial examination he had recently arrived from Liberia. 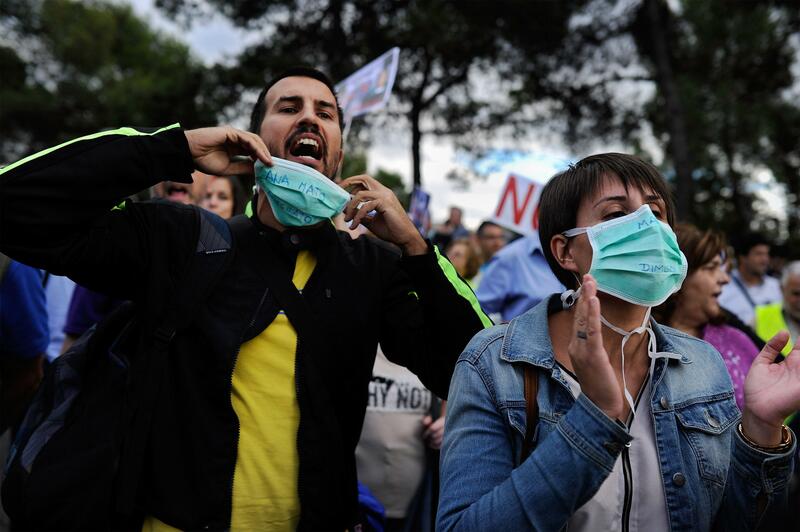 On Wednesday, days after Spanish nurse, Teresa Romero Ramos, tested positive for the virus, reports out of Spain have begun to piece together what amounts to a woeful response to its first case of Ebola. How bad are we talking? For starters, Ramos, who was not quarantined until five days after her first symptoms, says she told Spanish health authorities “at least three times that she had a fever before she was placed in quarantine,” the Guardian reports. That lack of response came despite the fact Ramos contracted the virus because she recently worked directly with a patient who was infected in Sierra Leone and had returned to Spain for treatment. [Ramos’] first contact with health authorities was on 30 September when she complained of a slight fever and fatigue. Romero Ramos called a specialised service dedicated to occupational risk at the Carlos III hospital where she worked and had treated an Ebola patient, said Antonio Alemany from the regional government of Madrid. But as the nurse’s fever had not reached 38.6C, she was advised to visit her local clinic where she was reportedly prescribed paracetamol. Days later, according to El País newspaper, Romero Ramos called the hospital again to complain about her fever. No action was taken. On Monday, she called the Carlos III hospital again, this time saying she felt terrible. Rather than transport her to the hospital that had treated the two missionaries who had been repatriated with Ebola, Romero Ramos was instructed to call emergency services and head to the hospital closest to her home. She was transported to the Alcorcón hospital by paramedics who were not wearing protective gear, El País reported. On arrival at the hospital, Romero Ramos warned staff that she feared she had contracted Ebola. Despite the warning, she remained in a bed in the emergency room while she waited for her test results. She was separated from other patients only by curtains, hospital staff said on Tuesday. “On Wednesday morning, the prime minister, Mariano Rajoy, called for calm as he promised ‘total transparency in giving all the information that could be given’ on the outbreak,” the Guardian reports.